Cambridge College of Healthcare & Technology/Cambridge Institute of Allied Health & Technology helps students take advantage of the opportunities provided by this growth in the field of medical assistants. 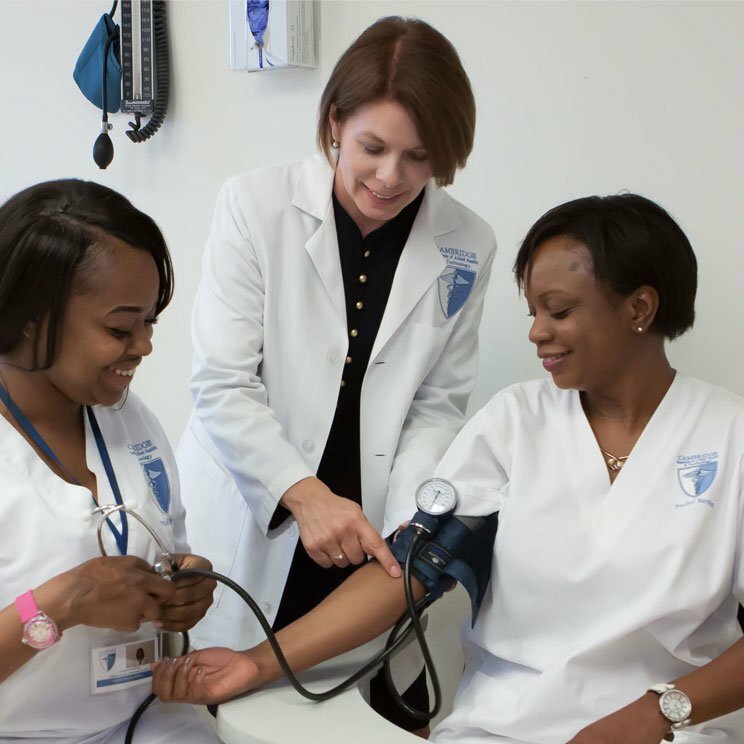 Our Medical Assistant certification program arms students with the knowledge and skills needed to become marketable within their field, and to succeed in a number of healthcare settings. Focused curriculum: Our Medical Assistant certification program covers the necessary materials you need to be successful in your career, without unnecessary distractions. From start to finish, students focus on developing the skills and knowledge needed to function as a medical assistant and play a key role in the delivery of patient care. Hands-on approach: Cambridge College offers a truly hands-on learning experience. In addition to classroom instruction, students are offered the hands-on training necessary to perform a wide range of clinical procedures, including medication administration, injections, EKGs, assisting with minor surgical procedures, phlebotomy and more. The Medical Assistant Certification Program is offered at our Palm Beach area, Orlando area and Atlanta area campuses. Employment for Medical Assistants is expected to grow faster than the national average for all other occupations—as much as 34 percent from 2008 to 2018. As a certified Medical Assistant, you’ll be qualified to work in a wide variety of healthcare facilities, including: physician’s offices, outpatient medical facilities, hospitals and clinics. What Does a Certified Medical Professional Do? Students who complete the Medical Assistant program at Cambridge are eligible to sit for the RMA, CMA and NCCT national registry and certification examinations. Additionally, students are eligible to site for the Phlebotomy and EKG NCCT certification examinations. While these credentials are not necessary for employment as medical assistants, such credentials can be earned after graduation. Upon graduation of X-ray component of the program at Cambridge, students may take the Basic X-Ray Machine Operator licensure exam in the state of Florida (BXMO). Earning one or both areas of medical certification requires hard work, dedication and a commitment to your future. Rest assured, the professionals at Cambridge are ready to assist and support you through every step of your journey. We are always focused on your personal and professional success.